Does the appearance of a cupcake shop mean a neighbourhood has gentrified? 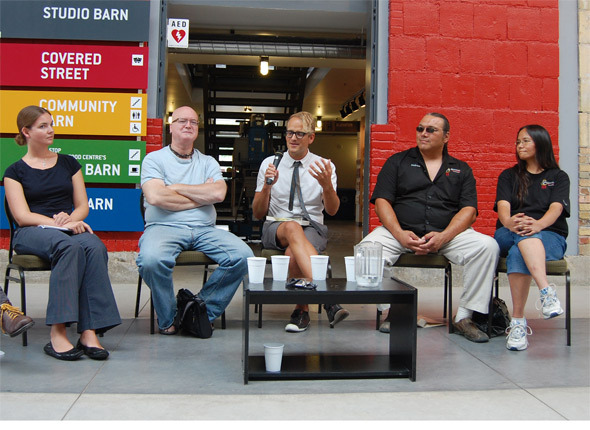 This was just one one the many topics debated and discussed this past Saturday at Wychwood Barns during the FoodPrint Toronto event. Founded by Nicola Twilley and Sarah Rich, FoodPrint is a series of international conversations "examining the hidden corsetry that gives shape to urban foodscapes." The event here in Toronto was the second in the series, the first happening this past February in New York. FoodPrint comes to Toronto on the heels of a lot of change to our city's foodscape. Not only are farmers' markets sprouting up as quickly as we can plant the seeds of the local food movement's virtues, but community focused efforts from the likes of The Stop, FoodShare and Not Far From The Tree (to name only a few) are gaining momentum and a lot more public awareness. And the cherry on top is most certainly our new city-wide food strategy - making now a perfect time to talk about food and its influence on the city. The afternoon consisted of four themed panels: Zoning Diet, Culinary Cartography, Edible Archaeology, and Feast, Famine & Other Scenarios. Bringing together a variety of ideas and voices - writers, architects, academics, policy-makers, retailers, fruit gleaners, fishers, and community workers among them - FoodPrint Toronto inspired the kind of conversation you might expect at an event that intellectualizes food. Issues like how Toronto's food system could be more sustainable through improving the protection of farmland, and how consumers can impact grocery chains like Longo's with their buying power were discussed. But panelists also talked about the realities and limitations of urban agriculture and how we are in desperate need of new, young farmers. The diversity of panelists also lead the conversation in unexpected and interesting directions like how ethnic restaurant decor has changed over the last 20 years, or what traditional native fishing techniques consist of. Barbara Emanuel, a Senior Policy Advisor at the Toronto Board of Health and one of the leads on the city's new food strategy, underscored both the virtues and limitations of urban agriculture. While in her opinion there is much potential for improving accessibility in low-income neighbouroods and building a sense of community through urban ag, we simply can't achieve the scale needed to feed the entire city. There was also talk about shifting the focus to sub-urban agriculture, due to the availability of more space (bigger backyards! More of them!) and due to the fact that most suburbanites can't walk to grocery stores. The idea of "culinary cartography" was interesting - narrowing the "what" on a map to centre around some aspect of food culture, infrastructure or identity - like this image that re-purposes the subway map to show the foods and locations of our ethnic neighbourhoods. Another map, developed for the New York FoodPrint event, plotted cupcake shops to plot the progression of gentrification in different neighbourhoods. The Toronto equivalent could be cupcake shops, indie coffee houses, or maybe gourmet burger joints. According to Laurel Atkinson, Program Coordinator of Not Far From the Tree, fruit gleaners see the world through "fruit goggles" and continuously plot fruit trees for their own culinary cartography purposes as they wander around neighbourhoods looking for fruit that might otherwise go to waste. Shawn Micallef, editor at Spacing Magazine, flaneur, and author of Stroll: Pschogeographic Walking Tours of Toronto, pulled from his essay in The Edible City and talked about the evolution of ethnic restaurant decor as going from "over-the-top ethnic-ness" (think "colonial Peking") to something only reminiscent of ethnicity, and not obviously tied to any one culture (think the Pan Asian Spring Rolls chain). Rebecca O'Neill, a PhD candidate in the University of Toronto's Department of History, is studying the evolution of school lunches. She is looking at what foods (she dubs them 'Brain Foods') drove the overriding goal of "wholesomeness" and "body building" for school lunches between 1941 and 1980. Today, the focus of school lunches isn't "wholesomeness" and "body-building" so much as trying to fight obesity. The day ended with a discussion about what the future of food looks like in Toronto. Evan D.G. Fraser, professor and author of Empires of Food: Feast, Famine, and the Rise and Fall of Civilizations, emphasized the need to view local food production as "insurance" against a global food crisis. He believes houses, municipalities, and the country as a whole need better stocked larders. That we should learn and take heed of the lessons our grandparents taught us through conserving, preserving and being prepared for tough times ahead. So what is the future of the foodscape in Toronto? FoodPrint co-founder Sarah Rich used the quote "You have to be able to articulate what you want in order to get it." A fair, if not somewhat Opra-esque, point. Even assuming that the collective "we" can articulate what we want for Toronto's future, that collective "we" is made up of a lot of individual "me"s and the next challenge will be in turning all those ideas, visions, and hopes into a cohesive plan of action.